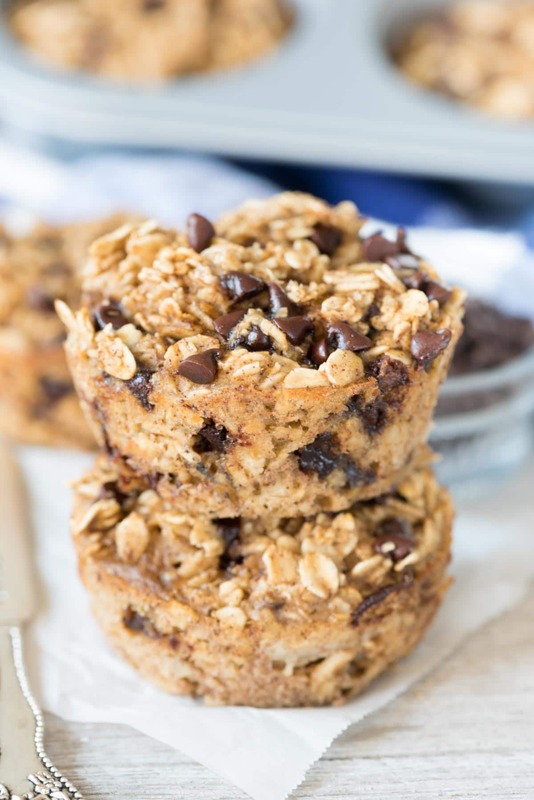 Chocolate Chip Baked Oatmeal Muffins – this EASY breakfast recipe is great for on the go! It’s a healthier muffin that’s dairy free and has no oil or flour but tastes like an amazing chocolate chip dessert! Did you notice the new facelift Crazy for Crust got for the new year? If you click on over to the home page you’ll see a brand new featured section up top, as well as some category sections down below. My most favorite new feature is how you can now find recipes even easier. You can search by category OR by ingredient (so if you’re craving caramel you will be taken to a list of everything with those ingredients). SO much easier, right? AND…not just that, but I’m going through every category and adding sub categories to make it easier to find what you want. 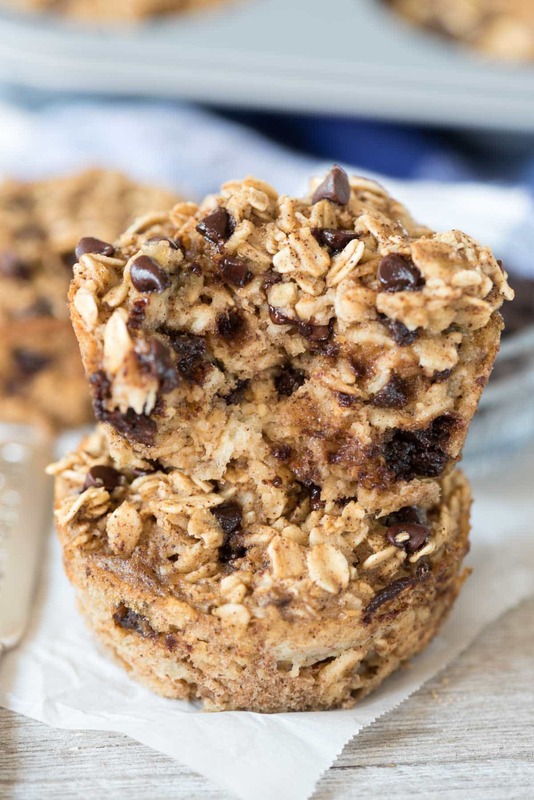 So, in the breakfast category, you’ll see a link for muffins and oatmeal, where these Chocolate Chip Baked Oatmeal Muffins appear (also, you can find them under chocolate chips and oatmeal). These changes are perfect for the start of a new year. You might start to see a few changes around her (not very many, don’t worry). I’m going to post more of what I eat on a daily basis…and yes that means cookies and pie…and muffins made with oatmeal and chocolate! If you’ve read this blog for any length of time you’ll know I don’t love cooked oatmeal, but I love baked oatmeal. 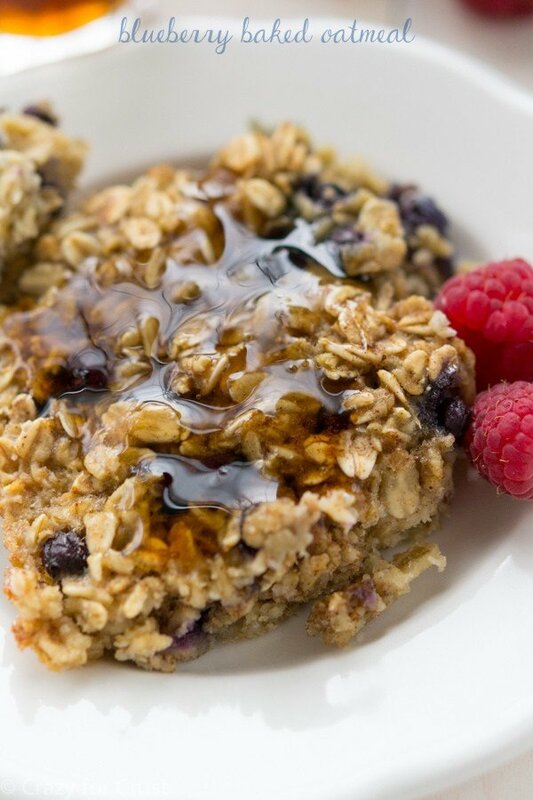 Baked oatmeal has a completely different texture than the gloppy cooked kind does. It has more chew, and you can really taste the oats. 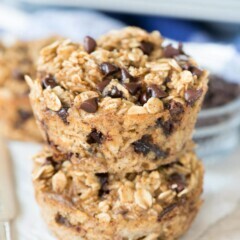 I’ve been making it baked for a few years now and one of my favorite things to do is to make the baked oatmeal into muffins. This way they’re easy for on the go! Jordan can easily take one for snack, or I can grab one after my workout. They do well in the freezer too! 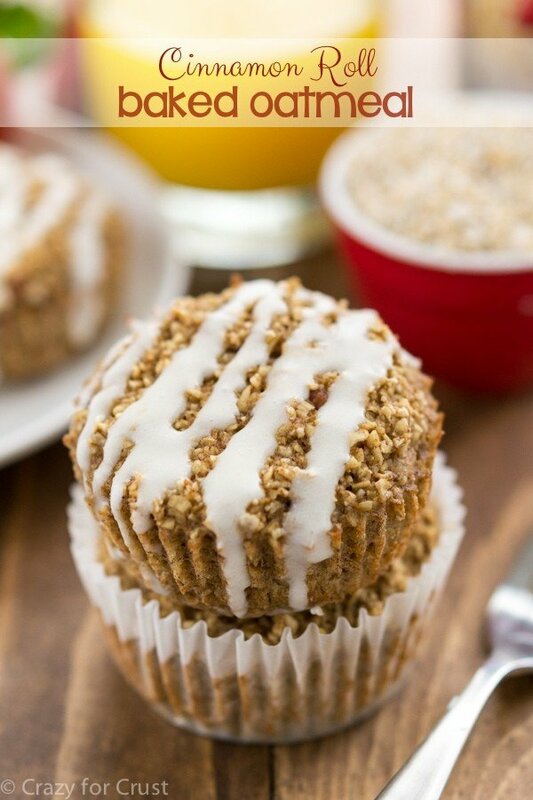 The beauty of these baked oatmeal muffins is that they have NO oil or butter or flour in them. All they use for binding are eggs and lots of old-fashioned oats, and in place of the oil I use mashed banana. (You can also use applesauce.) 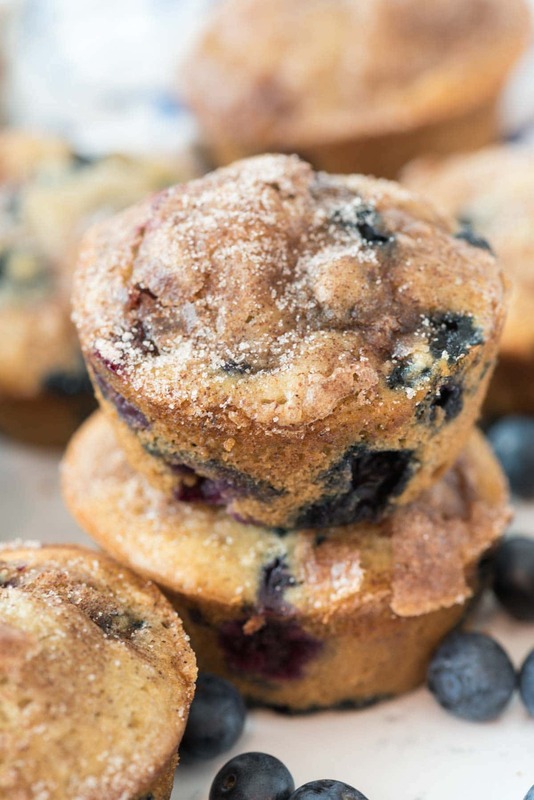 That makes these a much healthier alternative to a regular muffin, but you won’t even notice because, um, CHOCOLATE. In my quest to share with you things I love, I’m going to keep on talking to you all about almond milk. 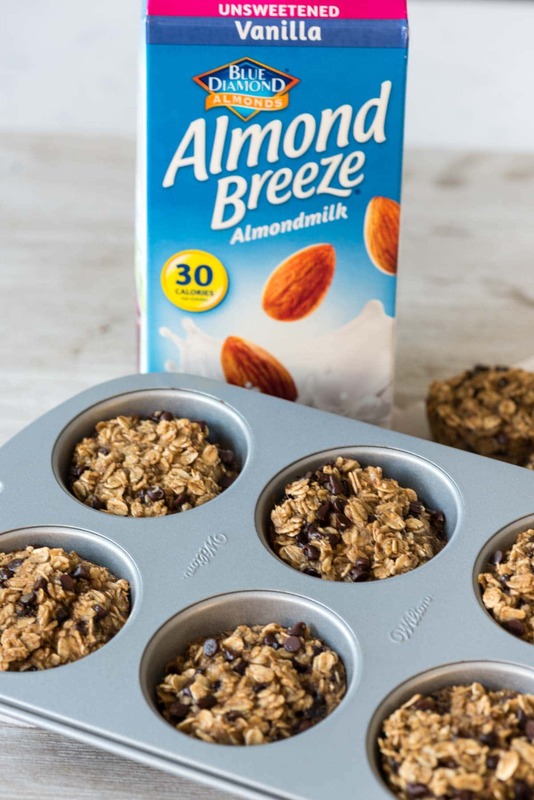 I’ve been using almond milk for years in baking and cereal. I myself never use regular milk for personal use anymore, it’s all almond milk all the time, and my favorite brand is Almond Breeze. I love the flavor of this brand more than any other, plus it’s a company that’s local to where I live (Sacramento). I don’t have to be dairy-free, but I just like using it more because it has less calories than milk and it’s pretty much interchangeable. Give it a try, you might like it! Also, give these muffins a try because…CHOCOLATE!! ? Preheat oven to 350°F. Spray a muffin pan with nonstick cooking spray or line with liners and spray those with nonstick spray. Whisk eggs, mashed banana, brown sugar, and vanilla until smooth. Stir in cinnamon, salt, and baking powder. Stir in oats and almond milk. Gently fold in chocolate chips. Scoop into muffin pan (about 1/4 cup per muffin; they don’t rise much so you can fill them to the top). Bake for 18-20 minutes until oatmeal is browned and not jiggly in the center. Cool slightly before attempting to remove from pan. Store in refrigerator up to 2 days. You can also freeze for quick morning breakfasts! You can also substitute an equal amount of unsweetened applesauce in place of the banana. © Crazy for Crust. All images & content are copyright protected. Please do not use my images without prior permission. If you want to republish this recipe, please re-write the recipe in your own words, or link back to this post for the recipe.